A top government official who allegedly stole an assortment of Cyclone Idai donates wept in court uncontrollably after she was denied bail. 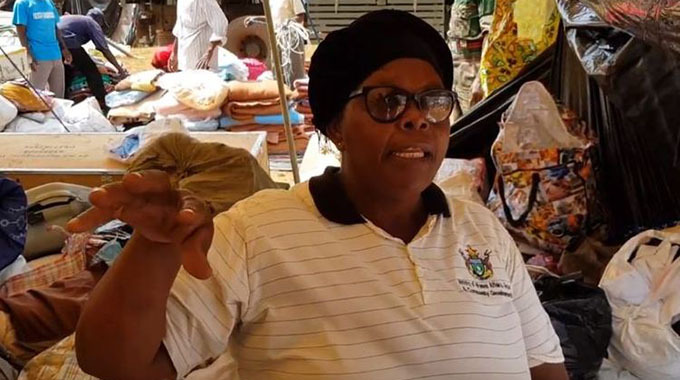 Christine Chideme (63), a deputy director in the Ministry of Women Affairs, Community, Small and Medium Enterprises Development was nabbed while carrying goods worth $3 000 that were donated by well-wishers towards Cyclone Idai survivors. Chideme appeared before resident magistrate Mr Farai Gwitima who remanded the matter to April 17. Majonga requested to search the vehicle and the accused person accepted. She told Majonga that she was carrying some groceries which were on a voucher she was given by members of the civil protection committee at Silver Stream in Chimanimani. After finalising the search Majonga found out that the groceries which were written on the voucher were fewer than the goods loaded in her vehicle. Upon interrogation, Chideme failed to give a satisfactory statement leading to her arrest. Some of the goods which were stashed at the back of the vehicle included 6×35g peanut butter, 3×30 cotton pads, 6×10 Happy pads, 11×500ml Bonaqua mineral water, 2×125 Tanganda tea three leaves, 4×2,5kg porridge, 12×125g Arenel biscuits, 4×2,5 tsabanga porridge, 5×2kg rice, 2×6 pack candle, 8 boxes of 6×25g bathing soap,1kg mega salt, 6×2litre orange crush and 12 pure drop cooking oil.